The mother-son duo arrived in Jaipur on Monday to be quizzed on an alleged land scam in Bikaner. 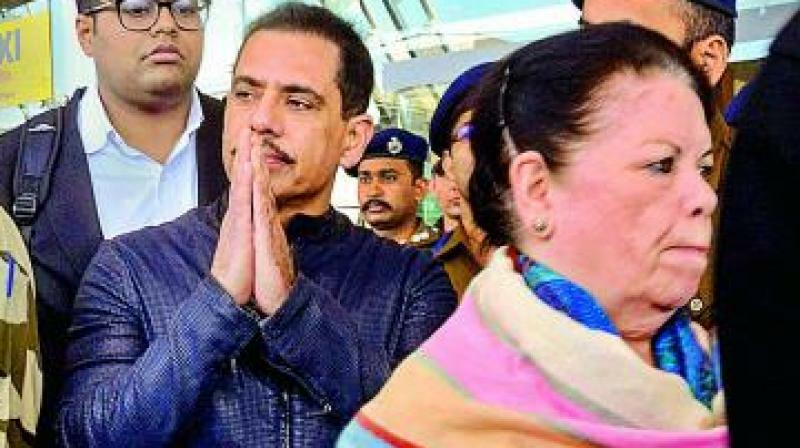 Jaipur: UPA chairperson Sonia Gandhi's son-in-law Robert Vadra and his mother, Maureen Vadra, appeared before the Enforcement Directorate here on Tuesday in connection with a money laundering case amidst heightened security. The mother-son duo arrived in Jaipur on Monday to be quizzed on an alleged land scam in Bikaner, the state’s border town. In November last year, the ED had for the third time issued summons to Vadra and his mother - a partner in the firm- for questioning but none of them appeared. Instead, they moved the High Court seeking a ‘no coercive action’ order and stay of their arrest. The fraudsters created forged allotment letters purportedly issued by the Colonisation Department of the state government and 1,422 ‘bighas’ of land was recorded in revenue record in the name of fictitious allottees without due verification of the allotment letters from the concerned department.